Today's guest post comes to us from Shane Mcc from NationalRVParks. Doesn't this make you want to visit Italy? Any trip to Northern Italy should include a visit to Lake Como. It is a popular tourist destination because of its fresh air, water, mountains and great weather. This lake is so beautiful that many celebrities like George Clooney, Madonna, Sylvester Stallone and Gianni Versace have purchased property there. It has also served as the setting for movies including the Stars Wars. Its appeal is truly legendary. My family, which includes my mother, father, brother and I, traveled to this pristine area of Northern Italy in October 2011 as a side trip while we were visitng Milan. Lake Como is in close proximity to Milan, Italy. 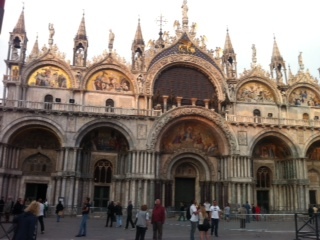 It is easily accessed by train from Stazione Centrale in downtown Milan. It takes about 45 minutes to arrive. We left on a quiet Sunday afternoon in mid October. After a short walk from the main train station called San Giovanni, we gazed open-mouthed at a vast expanse of clear, glass-like, calm water and almost in unison, a smile appeared on our faces. We all knew immediately why this area of Northern ltaly is so popular. The town of Como was our starting point to tour the lake. It has various docks where boats are available for transportation to other towns on the lake. The lake itself, is shaped like an inverted "Y", and is rimmed by small village-like towns that each have a dock for easy boarding and unboarding. These towns are rustic and quaint. 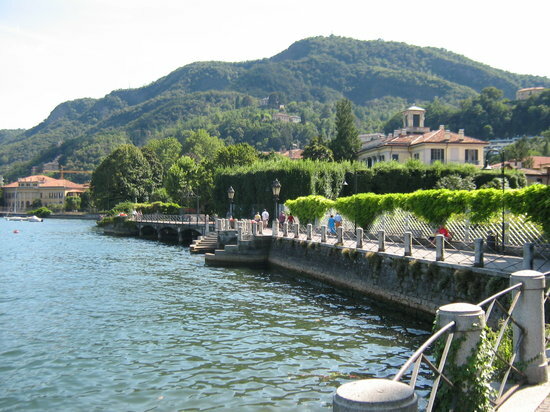 A visit to any of them is the quintessential Lake Como experience. Towns like Tremezzo, where the gorgeous Villa Carlotta is a must see attraction, Mennaggio, with its small wine bars, gelatarias, and cafes, and, Bellagio, the "pearl of the lake" are all worthy of a visit. Bellagio, in particular, was the most appealing for us. 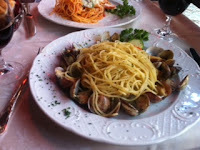 We had lunch at a small trattoria situated along the lakeside. I particularly remember a gentle breeze, soft sunshine and a breathtaking view of the surrounding mountains accompanying our bottle of Pinot Grigio and bruschetta. A pleasant lago di Como memory that i will always treasure. An interesting note is that the little town of Bellagio was Steve Wynn's, the well known Las Vegas impresario, inspiration for the Bellagio Hotel, the centerpiece of the famous Las Vegas Strip. The essence of an old Italian villagio comes to life in its buccolic surroundings. Bellagio is known as the "Pearl" of the Lake. Our visit to Bellagio will be incentive enough for us to come back. Bellagio also is the home of another must see attraction; the Villa Balbienello (the location of the famous Star Wars wedding scene). Its meticulously maintained grounds and its old world Italian architecture are of particular note. There are many other sleepy little towns and villages worthy of a visit on the Lake. If you are fortunate enough to spend a few days there, you can really get a chance to explore and enjoy Lago di Como . The only mistake that you can make about visiting Lake Como is not making plans to return. Please, take some time to view some photos taken of our perfect lake Como sojourn. 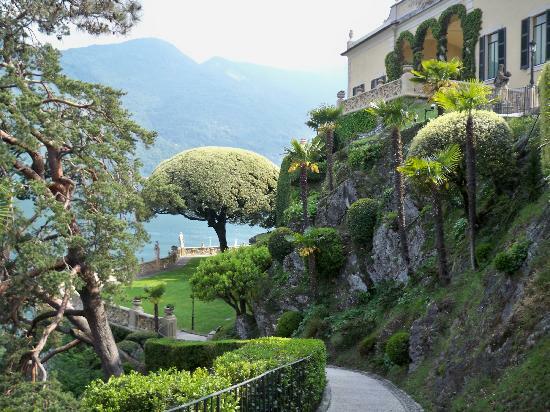 Villa Balbianello - True Star Wars fans make the pilgrimage to Lenno to view the famous wedding spot. Heck, it's even available for weddings, but that's not the budget part. For only a few euro per person, you can take a water taxi over to Lenno and for €5 you can view gardens of the villa and for €11 you can gain entry into the villa and gardens. Funicular Railway - Want to see the best views of Como? Well, for just € 5.10 you can get a round-trip ticket on the railway, built in 1894, to Brunate. Amazing views of the Alps and Como. Make sure you bring your walking shoes, or else catch the bus to the lookout and lighthouse. For €20 you can get a return ticket and dinner. Choose from a variety of restaurants participating in the promotion. Allow for enough time to explore the village of Brunate and take pictures. Villa Carlotta - Love plants and flowers? Then this is a fun place for you to visit. See over 500 varieties for €9 at this luxurious palace build in the 1600's. Bring a picnic lunch to enjoy in the gardens or have a quick bite at the coffee house. Jungle Raider Park - Starting at just €10, you can choose one of five courses (or a combination of them) and zip line, traverse rope bridges and other awesome outdoor amusements that test your skills and get you out in the fresh air.